"The Department of Agriculture and the Bureau of Fisheries and Aquatic Resources join the chorus of exultant voices in congratulating SEAFDEC's Aquaculture Department for chalking up 35 years of solid and meaningful contributions to the cause of sustainable development and responsible stewardship of aquaculture resources in Southeast Asia," Atty. 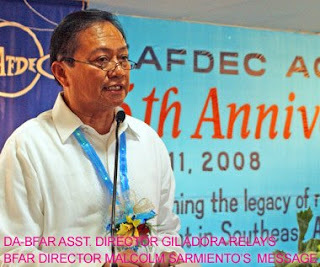 Malcolm Sarmiento, BFAR Director, said in his written message to AQD employees. "It says a lot about the stature, reputation and credibility of SEAFDEC/AQD that people from different cultures have taken time off from their busy schedules and traveled from near and far to express their collective appreciation and gratitude for the way this venerable institution has successfully elevated aquaculture research, training, technology transfer and information dissemination into a vital cog of food security and poverty eradication programs in the region. "The impact of SEAFDEC/AQD on the growth and development of the aquaculture industry cannot be overemphasized. During the last 35 years, it has pioneered in the development of various aquaculture technologies, the most notable of which include the seed production of the tiger prawn or sugpo; the breeding and production of milkfish; and, of late, the farming of commercially important aquaculture commodities such as abalone, mud crab, freshwater prawn, grouper, snapper, sea bass, rabbit fish, seaweeds and other freshwater fishes. "For all of us who live in the so-called biodiversity hotspots where resources for capture fisheries have been seriously impaired by a deathly mix of abuse and misuse, it is providential that SEAFDEC/AQD has come to the rescue in the form of science-based technologies that have resulted in rapid increases in aquaculture production – increases that have somehow made up for the steady decline in the contribution of the commercial and municipal fisheries subsectors to the national fish production effort. "The Philippine government has long recognized the thrust of SEAFDEC/AQD on harnessing research and extension for poverty alleviation and livelihood generation complements the long-term objectives of the Department of Agriculture and that of our agency, the Bureau of Fisheries and Aquatic Resources. It is for this reason that DA-BFAR has seen it fit to partner with SEAFDEC/AQD in the implementation of various production-enhancement and capacity-building activities. The most recent of these collaborations include the national abalone breeding and culture program, fish health management through training and collaborative research; aquaculture biotechnology program; dissemination and adoption of milkfish aquaculture technology in the Philippines; and, joint mission for accelerated nationwide techno-transfer program. "The good news is that by resolving to work together, DA-BFAR and SEAFDEC/AQD have managed to craft model schemes that facilitate coordination and cooperation, and in the process, enable both parties to extract the best conservation benefits from production-enhancement ideas that take into account the imperatives of sustainable and responsible aquaculture development. "We are thus happy to note that in its effort to remain competitive and relevant in the face of "increasing scarcity of resources available to it," SEAFDEC/AQD is gearing up to assume a more active role in technology transfer and verification but not at the expense of its primary mandate of research and technology innovation. We agree that no cap should be imposed on technology generation since the future holds great and demanding challenges that will require proactive research programs and directions. "In its 35 years of existence, SEAFDEC/AQD has gifted this part of the world with dynamic and trailblazing ideas that have removed the dangers, threats and uncertainties in production-oriented aquaculture projects. "We wish it well in its desire to leave behind a stronger legacy of stronger aquaculture development through programs and projects that will enable the countries in the Region to maximize their vast aquaculture potentials without compromising the ability of future generations to meet their own needs."